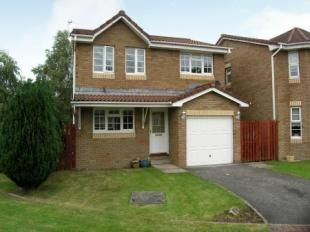 Home report available 1 Dunbar Lane is a modern detached family home situated within the ever popular New Stevenston locale. The property itself enjoys an enviable corner setting and offers good sized accommodation over two levels, lower level offering welcoming entrance vestibule, fitted kitchen and impressive lounge / dining area with French doors to garden. The upper level gives access to a landing area, three good sized bedrooms, master featuring re-fitted en-suite facilities and bathroom. Features of the property include double glazing, gas central heating and all blinds. Good sized and level garden grounds surrounding incorporating driveway providing ample off street parking whilst leading to an integral garage. A popular setting allowing easy access to local New Stevenston, Motherwell and Hamilton facilities and destinations further afield can be accessed via both public transport and road routes. The area is also renowned for quality primary and secondary schooling. Representing an excellent example of its kind, the agents suggest early internal viewing. Entrance Vestibule Enter through double glazed front door. Vestibule giving access to kitchen and lounge / dining area, door also leading to integral garage, laminate flooring, radiator. Kitchen9'11" x 8'1" (3.02m x 2.46m). Fitted kitchen featuring a range of wall and floor mounted units with contrasting worktop surfaces, front facing double glazed window formation, white sink and drainer unit, appliances including washing machine and dishwasher, integrated oven, hob and extractor fan, decorative tiling to walls, varnished floorboards, radiator. Lounge / Dining Area20'3" (6.17m) (narrowing to 11'8" (3.56m)) x 18'3" (5.56m) into windiow (narrowing to 15'3" (4.65m)). Fabulous open plan lounge / dining room area with rear facing double glazed window formation and double glazed box bay window and French doors giving views of and access to the rear gardens. Two ceiling mounted light fittings, staircase with timber balustrade leading to first floor. Focal point being limestone and marble feature fire surround with living flame gas fire. Two wall mounted light fittings, laminate flooring, two radiators. Stairs to first floor landing Landing offering access to all upper apartments, loft access via ceiling hatch, fitted linen cupboard, radiator. Master Bedroom11'8" x 11'6" (3.56m x 3.5m). Master bedroom with two front facing double glazed window formations, feature spotlighting to ceiling, fitted mirror wardrobe, radiator. En-Suite Attractive re-fitted en-suite comprising wc, wash hand basin and walk in shower cubicle with electric shower, side facing double glazed opaque window formation, decorative tiling to walls and floor, wall mounted stainless steel heated towel rail. Bedroom Two11'5" x 9'2" (3.48m x 2.8m). Second double bedroom with rear facing double glazed window formation, fitted wardrobe, radiator. Bedroom Three8'7" x 7'6" (2.62m x 2.29m). Final bedroom with front facing double glazed window formation, fitted wardrobe, radiator. Bathroom Bathroom with white three piece suite comprising wc, wash hand basin and bath with shower attachment, rear facing double glazed opaque window formation, decorative tiling to walls, tile effect laminate flooring, radiator. External The property has garden grounds surrounding. The property boasts an enviable corner plot, the garden grounds are mainly laid to lawn, these are fenced and walled off to provide a good degree of privacy. To the front there is a slabbed path leading to the front door, the front of the property also features a tarmac driveway providing ample off street parking whilst leading to the integral garage. The garage features power and light has an up and over door to the front and a door giving access within the vestibule also. The rear gardens have a sizable laid to lawn area and an outside tap is also situated at the front.